The Bronze Age Huntress was Helena Wayne, the daughter of the Batman and Catwoman of Earth-Two, an alternate universe established in the early 1960s as the world where the Golden Age stories took place. Following the 1985 miniseries, Crisis on Infinite Earths, the Helena Wayne version of the Huntress was removed from continuity. 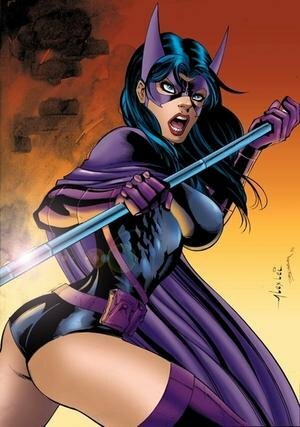 DC Comics introduced a new version of the Huntress with the same first name and physical appearance, and with a similar costume, but with an entirely different backstory and different personality. The Modern Age Huntress is Helena Rosa Bertinelli, the daughter of one of Gotham's mafia bosses who, after seeing her entire family murdered by a mob hit, vows revenge. Batman considers her to be too unpredictable and violent. Others in the Batman family feel differently; Nightwing had a brief romantic fling with her, while she and Tim Drake share a good professional relationship. Early in his career he worked with the female vigilante, and later cleared her name in a murder case. Batman sponsors Huntress's membership in the Justice League, and for some time, Huntress was a respected member of the League. Under the guidance of heroes such as Superman, she grew in confidence, but was forced to resign after Batman stopped her from killing the villain Prometheus. The character was featured in the comic book Birds of Prey from 2003-2009 as a member of the eponymous team. Although she is still depicted as prone to excessive violence, she became a valuable member of the team. loving the picture with powergirl.